#1 dribbles to the wing on the same side as #'s 2 and 5. #2 will cut from the corner to the low post on his side and post up for a possible post feed. If #2 does not get the ball after posting up for a count of two, #2 will come up halfway to set a back screen for #5 so that he can post up. #1 can pass to #5 for a possible post feed or to #2 at the top of the key. When the ball is swung to #2, #5 will set a sigle screen and #'s 3 and 4 will set a double screen. The cutter will be #1 who comes off of the single-double screen and catches the ball at the wing. 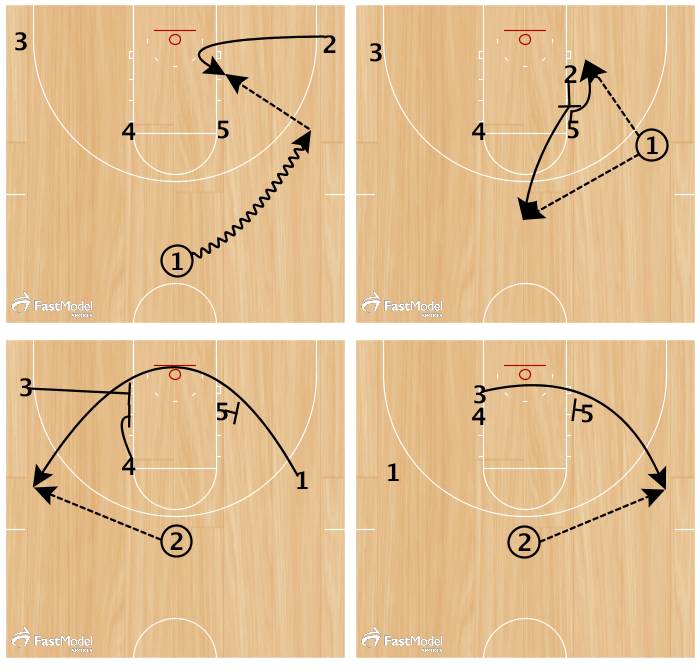 After #1 clears the double set by #'s 3 and 4, #4 comes off of the down screen set by #5 and curls to the wing opposite #1.